Fly-Carpin: "At Least You Will Have Something To Blog About"
"At Least You Will Have Something To Blog About"
My partner in crime Chris Galvin was referring to the fact that I was stuck with one leg knee deep in quick-gravel (no other way to describe it) like a fly to honey for about 15 minutes. In the picture below we had both been digging with a stick and our hands up to our shoulders for at least 10 minutes and I was still stuck. Of course as amusing as my foolishness can be, that is not what I really want to blog about. 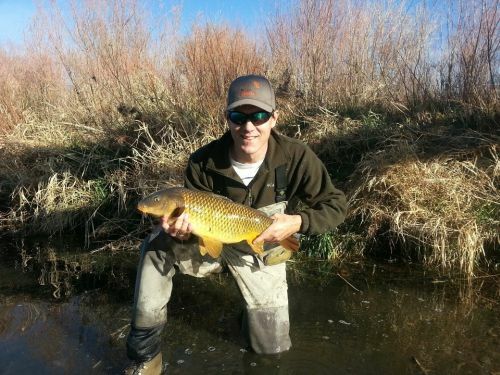 I really like to blog about catching fatty carp in the winter. Good thing we had enough time left over from "hilarious in an hour or two" shenanigans to do a little of that too. Although I am willing to bet Chris found it amusing immediately. I would have. At any rate we didn't get many shots today. We had a 10 degree cold front come through and that is murder this time of year. Between us I think Chris and I had 5 total shots that we could really sink our teeth into. Fortunately one happy carp cut a 90 and hammered my fly on a slow swim. I have been working on the details of this fly on and off for well over a year now. Some folks may remember it as prototype 1. Options 2, 3 and combinations of 1 and 3 just never panned out. With an added pinch of McTage's McLuvin I think I am at a final design which I will get to posting this weekend. Huh, McTage's McLuvin. Pretty cool when the name of a fly just craps itself out of your subconscious like that. Same way I named the Trouser Worm, it just barfed into print in the middle of a post. McLuvin, huh? I like it. Nice fish. I like'em when they're all buttered up like that. Thats why I carry a bottle of Pam Ty. We have a sand bar that is quick, super spooky stuff to my old buddy, and to people who disregarded our warnings. 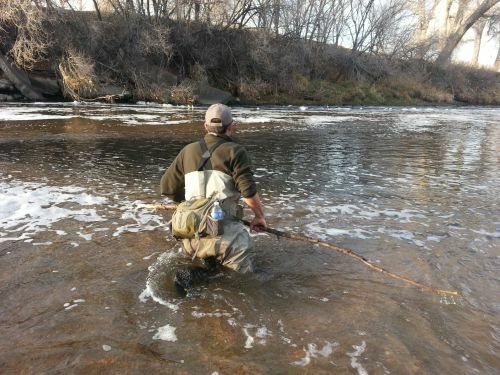 Cool, literally, fish on a neat fly! Now your 70F, I'm jealous. It was pretty nice today for sure but totally overcast. Thanksgiving day was the day to hammer them, I guarantee that. Glad you got out Trevor. Oh, and glad you caught a Carp too.